The new Rokker Original Raw Jeans are a major upgrade to the original Raw Jeans. The jeans feature new styling along with pockets for more armor to give these jeans more protection and a more subtle style. The new Rokker Original Raw Jeans have a new blacked out rear pocket which is great for those of us who were not fans of the pocket art that most Rokker jeans have. The added pockets for hip armor are also a welcome addition. 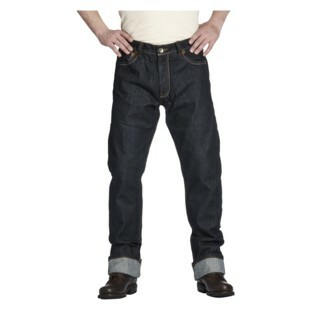 These jeans still use the same 13.5 oz Raw Denim which provides a great heavy duty feel. The jeans are straight cut and are made of selvage denim. The fit is very similar to that of the Levi's 501. The dyes they used look great and I am a big fan of how the denim turned out. These are really solid jeans and I highly recommend them if you are in the market for a straight leg jean with high levels of protection. Rokker seems like they will continue to be one of the best brands of riding jeans on the market.